The Lovers are an important card in the tarot deck. As anyone can guess, they have the most significance to matters dealing with relationships, because there are two of them and they are representative of relationships. This card is the seventh card in a standard tarot deck and is numbered 6 because the fool is usually considered the first, but is left unnumbered or as a zero in practice. When the lovers are drawn in a tarot spread, it can mean several things, but most of them relate to an important choice, so you would do well to continue reading in order to get a real grip on what this card means for you. The chariot is the 8th card in a tarot deck and is numbered seven due to the fact that the fool is one of the major arcana, and being either numbered zero, or left unnumbered, it is considered the first. While drawings always differ, the standard chariot card is usually depicted as a soldier of some sort being drawn in a chariot by beasts. In the case of more traditional decks, these beats are sphinxes, being rooted in Egyptian tradition, but whatever they are depicted as, the chariot card is still very significant and this is why it is considered part of the 22 major arcana. The justice card is the 9th card (or the 12th card depending on the tarot style) in a deck of tarot cards and is numbered either 8 or 11 depending on the deck. It is one off from the true number of the card since the fool is the first card in a tarot deck and is numbered either zero, or left unnumbered depending on the deck. The justice and strength cards switch between numbers 11 and 8 on a deck because throughout so many different styles of tarot play, they have been so equally interchanged that it is hard to trace any meaning to what the true numbering should be for each of them. The Hermit is numbered 9 in a standard tarot deck and is one of those cards that you can get a good sense of the meaning of by simply reading the name. The Hermit is an important card because; as you can tell from the name, it symbolizes solitude and singularity. The hermit is usually depicted as a tall man in a robe. He carries a staff in one hand and in the other he carries a lantern which is probably to help light his way since it is implied that he lives in a cave. 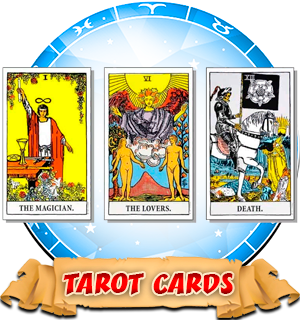 The wheel of fortune card is numbered ten in the tarot deck and is one of the major arcana. The idea of the card is one of the oldest in all of tarot and is modeled after the wheel that the Greek goddess Fortuna was said to carry. The card itself usually features a sphinx like creature atop a wheel that has many different ancient symbols on it. These symbols usually differ depending on the type of deck and the mythology that the deck is modeled after. If you would like to know what the card means in your own spread, read on. Strength is usually the 11th card in a tarot deck and is one of the major arcana. In some decks, such as the one compiled by Waite, a famous tarot interpreter, it switches placement with the 8th card in the deck, justice. This is because Waite designed his by astrological norms and interpretations. Both are considered entirely correct despite the fact that this does create differences and confusion. Oddly enough, on the card, the character depicted is usually a woman rather than a strong male figure, who would have normally been associated with power during the time that tarot was created. The hanged man is a card that is numbered twelve in the tarot deck, and usually seems to have somewhat of an ominous appearance. When the term hanged man comes to mind, people generally associate that with an image of a man hanging down after execution, but actually this man is literally hanging upside down. Sometimes it is from a beam, and other times it is from an actual cross, though he is not in crucifixion stance. But what is the meaning of the hanged man, keep reading to find out.